Bingo Beer Company, located at 2900 W Broad Street, is home to many layers of history and uses including today’s multi function brewery, restaurant and play space. 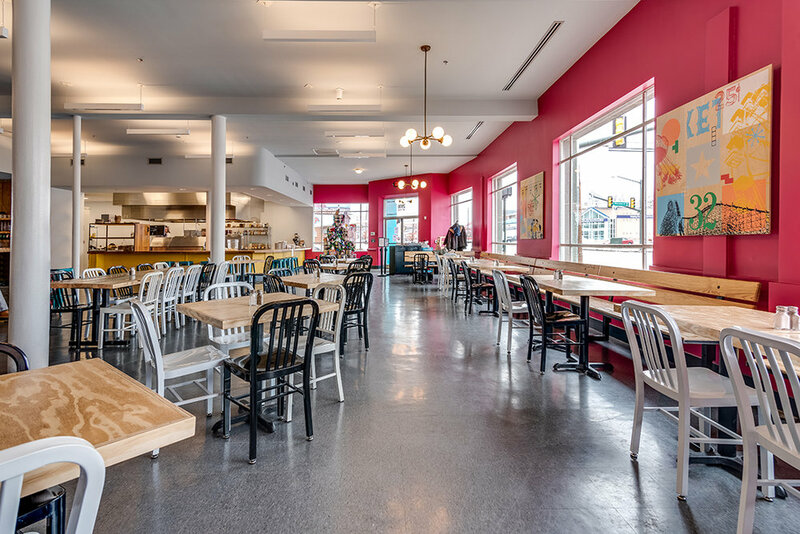 The Broad Street location is on the front doorstep of the burgeoning Scott’s Addition neighborhood known for craft beverages, great food and good times. The corner originally housed a 20 foot wide grocery with colorful awnings rounding the corner at Sheppard St. Over time, an automotive repair and refinishing shop was built immediately to the west which then expanded further west to the current footprint. At one point the warehouse portions housed the Subley bottling company, a foreshadowing of Bingo Beer Company’s production capabilities. In the late 1940’s the Bank of Virginia moved in and over the course of several years renovated all three spaces, combining the interiors and unifying the individual exteriors into a cohesive deco look using a uniform stucco finish and windows bound in exposed aggregate concrete frames. The Virginia Department of Taxation took over the space in the late 70’s dismantling the banking hall for carpet and dropped ceiling with fluorescent fixtures. In 1984 the facility was turned into a bingo hall and the windows were covered and interior plexiglass partitions divided the darkened space. 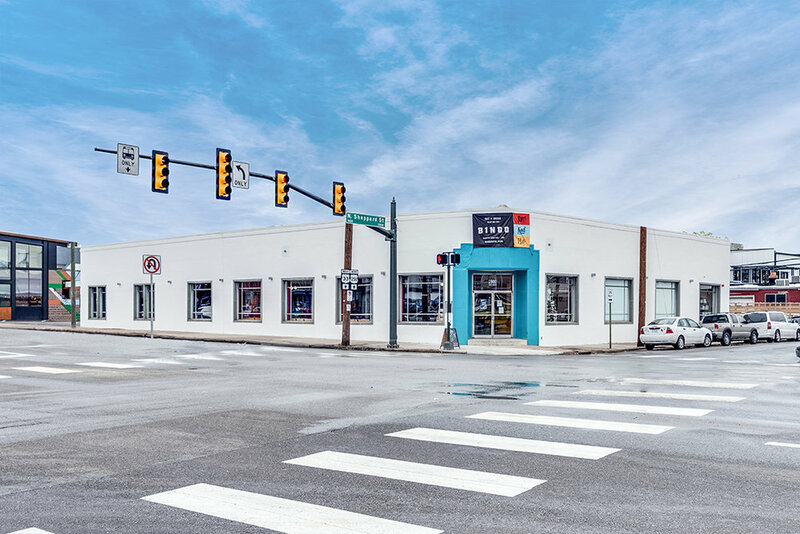 Fast forward to 2016 when the building was purchased and the decision was made to find a tenant that could use 12,500 square feet and undertake a renovation incorporating historic tax credit review and approval. The newly minted TOD-1 (Transit Oriented District) allowed for commercial uses with zero parking required. At the same time, neighboring properties were being developed and a shared parking concept was realized that is an amenity to several properties and businesses in the block. Bingo Beer Co. is the realization of several collaborators in the local food, beverage and hospitality industry. They envisioned a welcoming energetic space with a little something for everyone. The full kitchen and restaurant allows the freshly made craft beer to be supplemented with wine and cocktails. In turn, those beverages can be enjoyed with sit down meals and walk around finger food from 11 AM to 2 AM, 7 days a week. 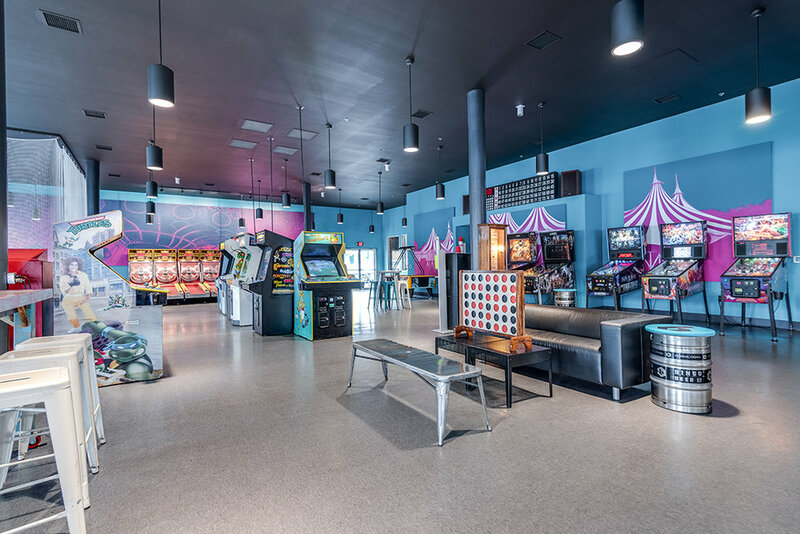 The play space component includes vintage video games, pinball, skeeball, billiards and ping pong along with an outdoor patio for the al fresco experience. An astonishingly diverse number of uses have occurred on this corner over the years and now, utilizing every nook and cranny, there is a little something for everyone.